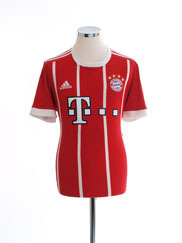 Bayern Munich football/soccer T-shirts & jerseys for sale which you can buy now online right now! Details: Home shirt as worn when Bayern Munich finished as champions of the Bundesliga, finishing 21 points ahead of second placed Schalke, and made it to the final of the DFB-Pokal, losing 3-1 against Eintracht Frankfurt. Also worn when Bayern were knocked out in the semi finals of the Champions League, losing 4-3 on aggregate against Real Madrid.